Programming is often seen as a male task, with super bright minded and geeky guys that solves the world’s biggest computer problems. This is actually not at all correct, since a lot of the evolution of computer science is thanks to women. One of the scientist we have to thank our language and programming to is Grace Hopper, a computer scientist and United States Navy officer. Grace Hopper, born in 1902 in New York, had a stunning career that started with graduating from Vassa College in 1928, and Yale University in 1934. 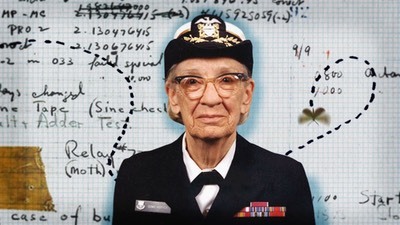 She had a Ph.D in mathematics and joined the US Navy during WWII in 1943. There, she worked with computers for 43 years, and later she moved into working in other private industries with companies. She died in 1992, leaving a ton of knowledge and progress to the world. Hopper was one of the first to work with digital computers, and she contributed a lot to the Harvard Mark I calculator, which came to revolutionise the mathematic classes. She also created the first program builder, called a complier, to use programming language. The idea that drove her in her research was to have a programming language that was closer to English than the machine code, such as assemble language. This way, the language would be easier to learn and use, and it would be much more effective since it would take less time. She started working on the so called COBOL language, that quickly became successful and not copywriter, making it easy and available for more programmers to use it freely. COBOL became the universal language for business coding. It was also the start to the rest of the programming language as we know them today – more similar to english than the machine and assembly languages. As I wrote earlier, the C programming language is very useful to software previously used with assembly language, and C is one of the more easily learned and used languages, also based on Hopper’s theory. Every time you read, learn or use a language that uses some english words instead of machine language, you have Grace Hopper to thank. You see, women in the computer science business makes great difference, and the world has yet not seen their last great female, or male, programmer.